Joseph Campbell may not be the best reading for the bus. Despite the many signs and placards gently suggesting to passengers both in the Port Authority Bus Terminal, and on the buses themselves, that keeping quiet is courteous, we are a people in love with noise. We are used to annoying electronic beeps, squawks, and farts. People find it difficult to sit more than 20 minutes without talking. I’m trying to read. At the Hunterdon County Library Book Sale I picked up Joseph Campbell’s last book, The Inner Reaches of Outer Space. It requires some concentration. 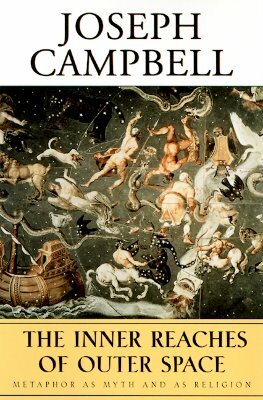 Campbell was a brilliant comparative mythologer. I was reared in the scholarly hermeneutics of doubt, however, especially when it comes to comparing myths from different cultures. Campbell has a great appreciation for Jungian concepts, and soon minor details are blurred and the similarities stand out in stark relief. Still, as I always do with Campbell, I came away with plenty of rich concepts over which to mull. Campbell, the great inspirer of Star Wars, the original series, was that rare breed of scholar who appreciated without participating. He is recorded as stating he was no mystic, and certainly not any kind of conventional religionist, but he couldn’t get enough of mysticism or mythology. Religion, he implies, is just mythology taken literally. He is, I believe, very close to the truth here. What we know of indigenous peoples today is that they don’t have that sharp and hard line between literal reality and story that marks much of western civilization. We tend to think fact and fiction cannot be of a kind. Looking around, we find no gods, so our choices are not to believe, or to believe too literally. And those who believe literally differently, we tend to want to kill. This is the history of religion in the western world, in a Campbellian nutshell. Apart from the little gems I located scattered throughout The Inner Reaches of Outer Space, the main theme I found applicable was the driving force of chapter two, Metaphor as Myth and Religion. Metaphor is our way of interacting with a reality we just can’t experience directly. As human beings, we experience the physical world through the mediation of our senses, filtered by our brains. If there is something deeper, more profound than nature, we are even further removed. Our experience of meaning is metaphor. Joseph Campbell may have been a little too swift to spot congruities that are probably best left apart, but he clearly recognized the fact that our religions are not so different from our mythologies, and that both are narrated in the form of metaphor. This is not to devalue them, for metaphor is one of the most potent substances in our chemistry set. Now if only I could find the vial that has the stuff to make people want to keep quiet on the bus, we might all be able to get a bit more reading done. This entry was posted in Books, Classical Mythology, Consciousness, Mysticism, Posts and tagged Hunterdon County Library Book Sale, Joseph Campbell, metaphor, mysticism, mythology, Star Wars, The Inner Reaches of Outer Space by Steve Wiggins. Bookmark the permalink.